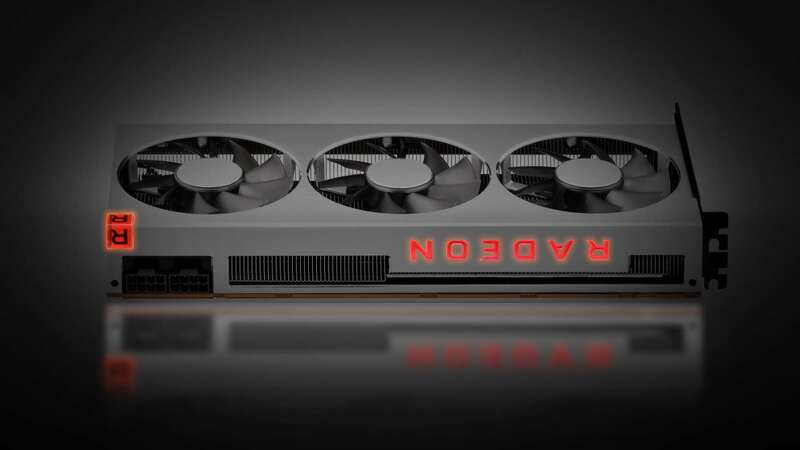 There will definitely be some rather smug faces in AMD HQ right now – not least in the marketing department, where they’ll be rubbing their hands with glee at the multi-faceted name they’ve come up with for the Radeon VII graphics card. Those Roman numerals aren’t just there to look all classy, y’know. 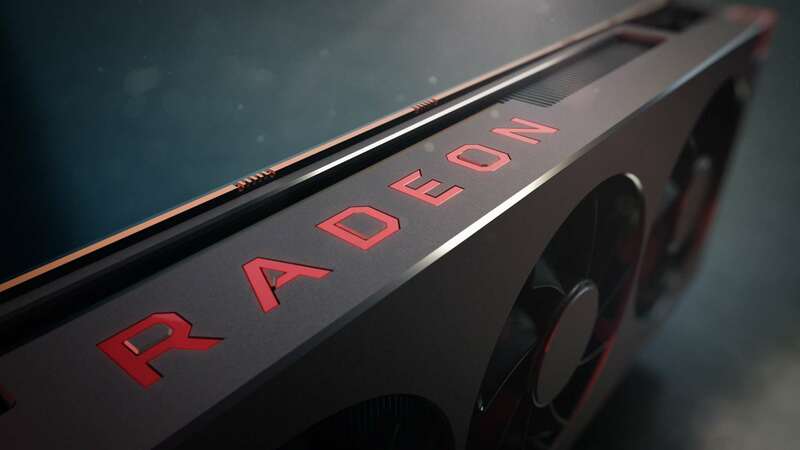 While the ‘Radeon 7’ translation does refer to the 7nm excitement surrounding the new GPU’s production lithography, the Radeon VII also represents the second generation of the Vega graphics architecture. Hence the VII – version 2, Vega 2, and all that. Subtext, eh? The first 7nm Vega GPUs, launched last year, were designed for the high-end professional market, not gamers. The pricey Radeon Instinct range of cards were aimed purely at the serious pro-sumer with very deep pockets and we were never sure whether AMD was ever going to bring the second-gen Vega chips down into the gamer market either… there were strong rumours that it wouldn’t. But finally here it is, with AMD’s CEO, Dr. Lisa Su, asserting the Radeon VII was always destined for a gaming desktop after her CES unveiling at the start of the year. And that was also where she set out her stall for the new Radeon GPU: to take on Nvidia’s RTX 2080, and even try and beat it. So, how close has AMD got with the Radeon VII? Can it stand toe-to-toe with the might of Nvidia’s Turing GPU design, or do we have another case of history repeating the qualified failures of the first-gen Vega cards? The new 7nm Vega 20 GPU at the heart of the Radeon VII is the star of the show, building on the hard work AMD put into the old Vega design. 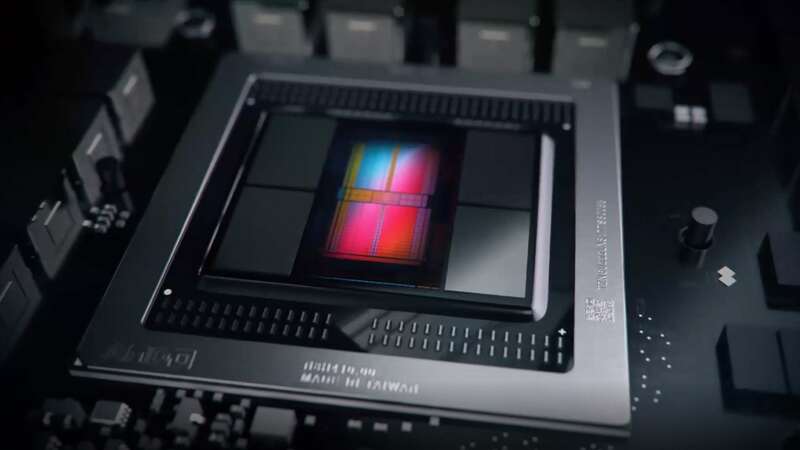 It’s effectively the same silicon as that used inside the Radeon Instinct MI50, but with a few gamer-extraneous professional accelerators disabled and with the absence of double precision processing. Those non-gamecentric features are reserved for the more-expensive pro cards so as not to cannibalise sales of the pricier GPUs, but the underlying silicon is the same and that means it has all of its video memory strapped onto the chip package. The Radeon VII is sticking with the super-expensive, but super-fast, second-gen high bandwidth memory (HBM2). But this time around there’s a whole lot more of it too. And it’s the 7nm die-shrink that’s the enabler here. The original Vega 10 GPU used the 14nm FinFET production process, and with the two generations of chip sat side-by-side you can immediately see how much extra space the shrink down to TSCM’s 7nm node has afforded AMD. The smaller Vega GPU in the middle of the package is now surrounded on all sides by four HBM2 memory modules, offering a total of 16GB VRAM capacity. That’s more than we’ve ever seen in any consumer-level graphics card. It could probably be considered overkill for the vast majority of games around right now, but it does seem to come into play as we move into the Radeon VII’s 4K gaming performance. The actual Vega 20 GPU is about 33% smaller than the Vega 10 chip – though the overall package is a little bigger. Despite the die shrink there is still the same amount of graphics silicon inside it, thought there are actually more transistors in play; some 700 million more. Where the full Vega 20 chip has 64 compute units (CUs), and therefore the same 4,096 GCN cores, the Radeon VII actually sports a slightly cut down version of the full-fat GPU. The first 7nm gaming GPU is shipping with 60 CUs and 3,840 GCN cores – fewer than the RX Vega 64 had at launch. There might be fewer cores, but the GPU as a whole is clocked much higher, with the Radeon VII shipping with a base clock almost at the same level as the RX Vega 64’s original boost clock. This extra GPU frequency is another symptom of the 7nm die shrink; a process node change which affords more areal density for transistors, but also the twin benefits of lower power and therefore lower thermals. That’s what has allowed AMD to really push the clock speed of the Radeon VII to its fullest. And that’s what it needed to do to compete with its Nvidia rivals. Though it has to be said the 1,800MHz ‘peak engine speed’ AMD has been touting feels a little misleading given the boost clock is actually rated at 1,750MHz. AMD has said the 1,800MHz figure is only something it’s seen when using content creation apps, and not something you’ll experience during gaming workloads. Indeed, for the most part I’ve been seeing a general clock speed of around 1,710MHz during my testing. You do also get all the same Vega feature goodness as with the original design. So you have access to all the Rapid Packed Math you could desire, as well as the High Bandwidth Cache Controller which promised so much when paired with the HBM2. As has become a familiar refrain with graphics card companies introducing extra GPU features, however, there are still relatively few games that actually take advantage of either Vega-exclusive features, and few, if any, on the horizon. But all the specs in the world are for naught without straight line gaming performance and here AMD has created the fastest consumer graphics card to ever come out of the red team’s Texan stables. The Radeon VII easily outstrips its RX Vega 64 progenitor, with the previous generation of AMD GPU unable to cope with either the larger framebuffer or the much higher clock speed of the new card. A GPU capable of taking on the finest gaming graphics card Nvidia made from its Pascal architecture. Mostly. That’s exactly what you’d have hoped for, but the real battle is against Nvidia’s top GPUs. A face-off with the RTX 2080 is where Dr. Lisa Su pitched the Radeon VII when it was first unveiled at CES in January. Now, don’t get me wrong, its relative performance compared with the Turing competitor is important, but how it performs compared with the last-gen GTX 1080 Ti is almost a fairer comparison. Both are purestrain rasterised rendering gaming cards, and here it’s mostly good news for AMD – it has managed to create a GPU capable of taking on the finest gaming graphics card Nvidia made from its Pascal architecture. Mostly. Across our benchmarking suite we’re looking at an almost 50/50 split between the Radeon VII taking the frame rate lead and the GTX 1080 Ti displaying a higher level of gaming performance. But the mere fact that AMD is able to post some considerable wins over the Nvidia card shows it really is competing at a very high level. The benchmark split isn’t such good news for AMD when it comes to its relative performance against the RTX 2080, however. There it is more heavily weighted towards the Nvidia Turing GPU, but again there are still some significant AMD wins. The Battlefield V performance is easily the most stand out result, especially at 4K where that 16GB of high-bandwidth memory really comes to the fore. At the top 4K Ultra settings the Radeon VII is 25% faster than the competing RTX 2080, posting performance almost competing with the far more expensive RTX 2080 Ti. And Battlefield V is a title which has been held up as the poster-child for the Turing generation of graphics cards. Admittedly that’s more because of its support for real-time ray tracing in its hybrid approach to rendered reflections, but having the AMD card displaying such a performance lead in traditional terms is still an important touchstone for the red team. Outside of that, however, it’s only Deus Ex: Mankind Divided, and occasionally Far Cry 5, which offer any other wins for AMD, with Shadow of the Tomb Raider (interestingly another former RTX promo title) showing a level of performance parity with the Turing GPU. It is worth pointing out that our benchmark comparisons are with a Founders Edition of the RTX 2080 card, and as such it houses a more expensive, factory overclocked GPU. That said, there are versions of the RTX 2080 available for effectively the same price as the MSRP of the Radeon VII. 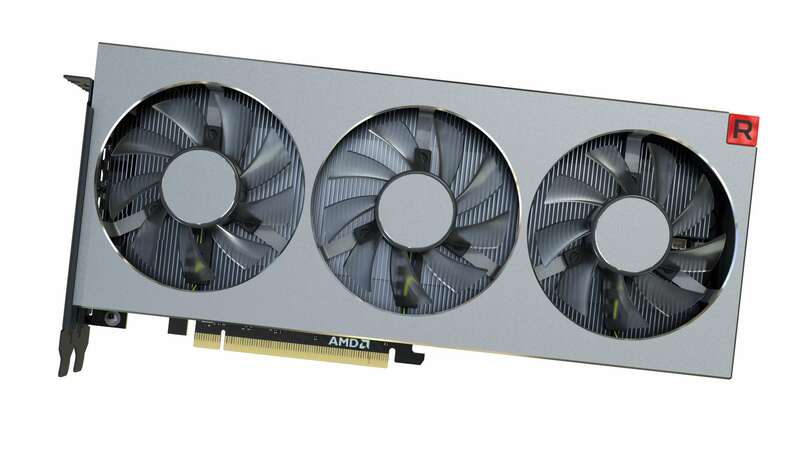 And, as I’m writing this pre-launch, we only have that MSRP to go on – given the rumours of low stock numbers it wouldn’t be surprising to see prices of the Radeon VII exceeding the suggested $699 (£650) pricing around the card’s release. The Radeon VII does provide the goods when it comes to the temperature and thermal performance of the new 7nm GPU. The peak GPU temperature we measured across our testing showed the new Vega chip only hitting 74°C, a far cry from the 87°C the original, lower-clocked, RX Vega 64 offers. Though its triple fan array is just as loud as the blower-style cooler on the original Vega, which means it’s VERY LOUD. During a PCGamesN office floor meeting, not-that-near the test rig, it was very noticeable people were raising their voices to compete with the Radeon VII while it was pushing a few million pixels and a bunch of polygons around. I just pretended someone was hoovering downstairs… y’know, NDAs and all that. The Founders Edition RTX 2080 is still a couple of degrees cooler at peak, and a little quieter too, but is also a more expensive GPU with that holy Nvidia Turing shroud wrapped around the card. But the 7nm Vega silicon is evidently less power hungry than the rest of the competing cards we’ve tested it against, and that’s a rarity for AMD. 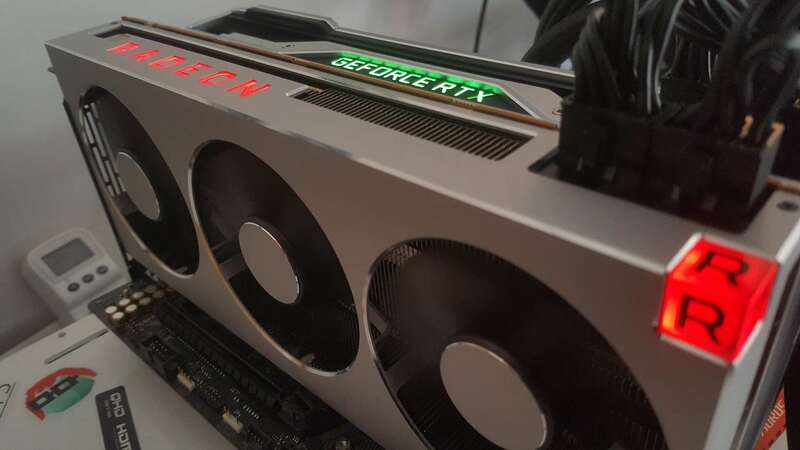 The red team has clocked the Radeon VII as high as it dares in order to compete with the RTX 2080, but has done so without demanding a huge amount of power from the wall socket. It draws 19% less power than the larger Vega 10 GPU, while having higher clocks and more transistors packed into its smaller die space. 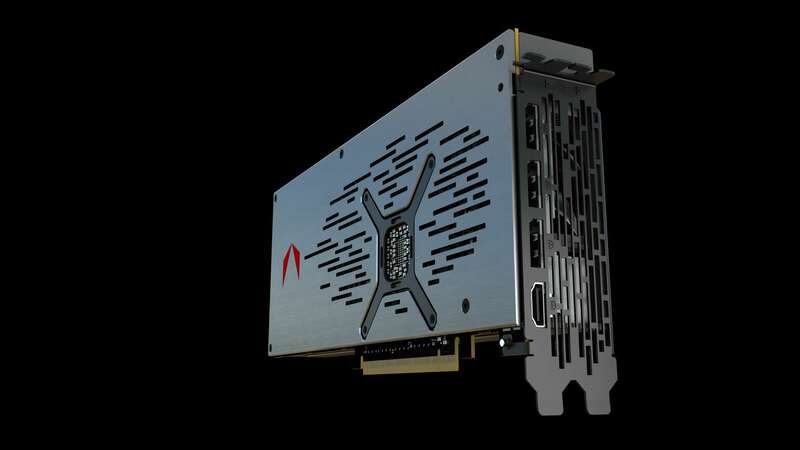 The “world’s first 7nm gaming GPU” may be a nice moniker for the Radeon VII’s marketing material, but it’s not going to be the AMD card to grab that elusive “world’s fastest graphics card” mantle from Nvidia. The fact it can genuinely stand toe-to-toe with the green team’s RTX 2080 in a rasterised rendering challenge, however, is still impressive. Mostly. There it is again. Every time I write something positive about AMD’s Radeon VII I hear that little Newt voice in the back of my head whisper: mostly. For the AMD faithful the solid relative performance compared with the RTX 2080 will be enough for them. It’s essentially the same price, and you can say that on average it performs about the same too. Sometimes it’s faster than an RTX 2080 and sometimes it lags way behind. More rare are the times where the performance is equal, however, which is maybe a little odd. While you can hold up the 25% performance win at 4K in Battlefield V, you can’t ignore the fact it’s 46% slower than the RTX 2080 in Assassin’s Creed Origins at 1080p. The schizophrenic nature of the AMD/Nvidia performance delta then is tough to parse. But that overall performance would normally be a cause for celebration for everyone – finally getting genuine competition at the high-end of the graphics game can only benefit the end user – but there are two things which still give me cause for pause instead. The first is that, while you may not be convinced by the early RTX feature support in released games, there is still some promise the RTX 2080 can offer something different and exciting in the future. It’s a weird situation where Nvidia’s relying on the fine wine approach and not AMD. With the AMD Radeon VII, however, there isn’t really anywhere it can go. It’s effectively clocked as high as AMD dares, it can’t risk unlocking all the cores in the full-fat Vega 20 GPU or else ruin sales of its professional cards, and it’s looking increasingly unlikely that Rapid Packed Math or the HBCC are going to be widely used in PC gaming any time soon. Price drops will be tricky too, what with the huge amount of expensive HBM2 sitting inside that Vega 20 package. Reports suggest it might make up as much as half the cost of the Radeon VII, so any price cut will devour AMD’s margins. It’s a pure rasterised rendering card – a really good one – but it has little else to offer. Just like the GTX 1080 Ti… and that’s my second issue with the Radeon VII. One of the problems I have with the RTX 2080 is that it only just about tops the last-gen Pascal card, while retaining the same prohibitive price. Were it not for the promise of the Turing shader, DLSS, and DXR real-time ray tracing support it would be an almost irrelevant release. And the Radeon VII doesn’t have any of Turing’s potential. So, in the end it just kind of looks like it’s taken AMD two years – and the expensive combination of 7nm die shrink and HBM2 framebuffer – to match the best of Nvidia’s last generation of graphics cards. And even then it’s hardly what you’d call a dominating performance. 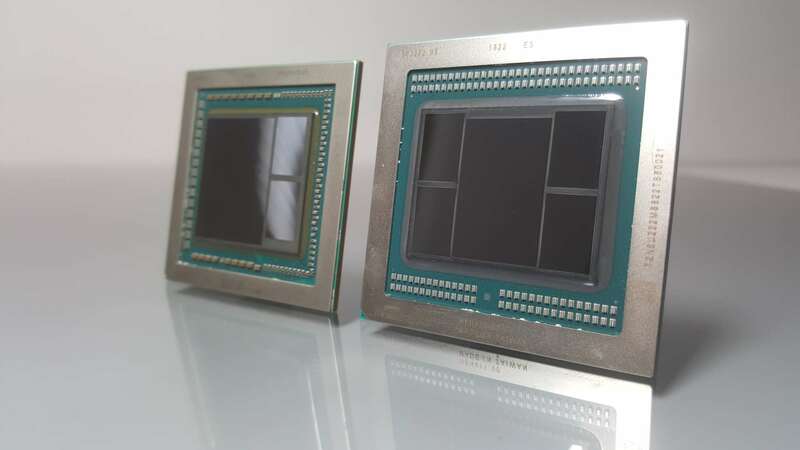 The real positive here though is the Radeon VII shows the 7nm die shrink really does provide AMD a lot of help in the graphics department. The Vega 20 isn’t that different from the Vega 10, architecturally speaking, and I didn’t think we’d see RTX 2080 or GTX 1080 Ti performance effectively just from a die shrink. If AMD’s Navi were just to be a 7nm version of Polaris it could still be the basis for a fantastic mainstream graphics card range. But with the architectural improvements we’re hoping for from Navi it could well end up being something rather special, and for a great many more of us than a $699 GPU would be. But still, back to today and we’ve finally got a great-looking, genuine high-end AMD Radeon graphics card for gamers, and one that deservedly bears the title too. For a great many people – y’know the ones, the serial Nvidia-haters – that will be all they need. It’s not revolutionary, it’s not the world’s fastest GPU, but it’s probably enough. Probably the best-looking graphics card AMD has ever made, with some serious engineering wins. But it’s an incredibly expensive GPU when it’s offering performance parity with Nvidia’s last-gen GTX 1080 Ti… for the same price. For many though, the fact AMD is competing might just be all they need.